Screaming On The Inside is a burning anthem about pressing through the emotional damage which is so often inflicted in life. Your heart will break—and soar—through these very personal and powerful stories of injury, devastation, and restoration. Read how one woman pushed beyond fear and pain to find the joy and peace of total acceptance in Jesus. Leann Albrecht is an internationally known and respected worship leader, recording artist, and public speaker. Her voice can be heard on hundreds of recordings and she appears at events around the world. 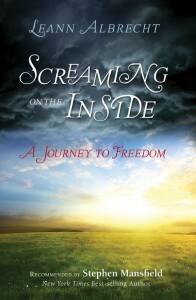 Screaming on the Inside is Leann’s first book. She and her husband, Carl, live near Nashville, Tennessee.